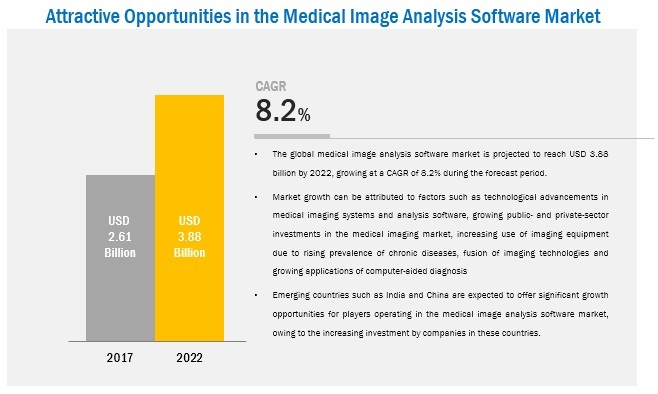 According to new market research report, medical image analysis software market is expected to reach USD 3.88 billion by 2022 from USD 2.61 billion in 2017, at a CAGR of 8.2% during the forecast period. Market growth is driven by technological advancements in medical imaging systems and analysis software, growing public- and private-sector investments in the medical imaging market, increasing use of imaging equipment due to rising prevalence of chronic diseases, fusion of imaging technologies and growing applications of computer-aided diagnosis. However, budgetary constraints are restraining the growth of this market to a certain extent. The base year considered for the study is 2017, and the forecast has been provided for the period between 2018 and 2023. In the recent years, the market has witnessed a growing trend of integrating two or more systems to get better image analysis and diagnosis. Among end users, the preference for PET/CT is higher as compared to standalone PET technology. This is because PET/CT provides better image quality. This combined technology has become one of the important tools in clinical practices and is preferably used for cancer care. Also, it is used to determine blood flow to the heart muscle and the effects of a heart attack or myocardial infarction on areas of the heart. It is easier and more cost effective to develop software for viewing a combined image rather than combining two technologies together physically. This is because physically merging two technologies will take a longer time and will require huge investments. Using software for fusion technologies saves around USD 4 million to USD 5 million in costs and also avoids technical challenges. Considering these advantages, the adoption of software that can provide combined images of two different technologies is expected to increase in the coming years. The study estimates the market size for 2017 and projects its demand till 2022. In the primary research process, various sources from both demand side and supply side were interviewed to obtain qualitative and quantitative information of the report. Primary sources from the supply side include various industry CEOs, vice presidents, marketing directors, technology and innovation directors, and related key executives in the market. Primary sources from the demand include hospitals, diagnostic centers, and research centers. For market estimation process both top-down and bottom-up approaches were used to estimate and validate the market size of the market as well as to estimate the market size of various other dependent submarkets. All possible parameters that affect the market covered in this research study have been accounted for, viewed in extensive detail, verified through primary research, and analyzed to get the final quantitative and qualitative data. This data is consolidated and added to detailed inputs and analysis from MarketsandMarkets and presented in this report. This research study also involved the usage of widespread secondary sources; directories; databases such as Hoovers, Bloomberg Business, Factiva, and Avention; white papers; annual reports; company house documents; investor presentations; and SEC filings. The medical image analysis software market is highly competitive with the presence various players. Some of the major players operating in the market are AGFA Healthcare (Belgium), AQUILAB (France), Carestream Health, Inc. (US), Esaote S.p.A (Italy), GE Healthcare (US), Image Analysis (UK), INFINITT Healthcare Co, Ltd. (South Korea), Merge Healthcare, Inc. (US), MIM Software Inc. (US), Mirada Medical Limited (UK), Philips Healthcare (Netherlands), ScienceSoft USA Corporation (US), Siemens Healthineers (Germany), Toshiba Medical Systems Corporation (Japan), and Xinapse Systems Ltd. (UK). In December 2016, Pickering Electronics Philips Healthcare (US) introduced Signed a 10-year partnership with Expert Group of Companies (Russia) to jointly improve the efficiency of the delivery of patient care in Russia. In June 2015, Siemens Healthcare (Germany) signed a contract with William Osler Health System (Canada) to expand its presence in the Canadian market. In November 2015, Vital Images, Inc. (US) partnered with Heilind Electronics (US), a global distributor to expand the company’s sensor product line through Stratasys, Ltd. (US) to develop print-on-demand services using Vital’s industry-leading Vitrea advanced visualization software and Stratasys’ 3D printing services. 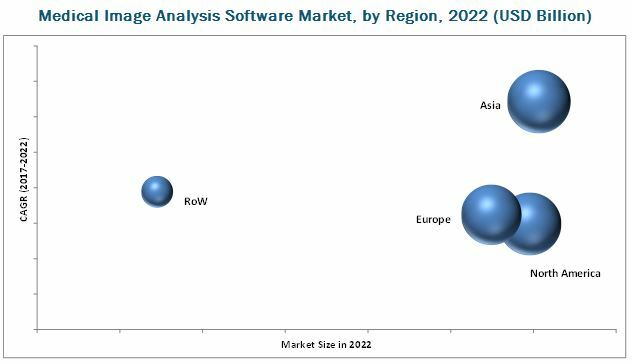 This report categorizes the medical image analysis software market into following segments and subsegments. What are new application areas which the medical image analysis software companies are exploring? The market is expected to reach USD 3.88 billion by 2022 from USD 2.61 billion in 2017, at a CAGR of 8.2% during the forecast period. 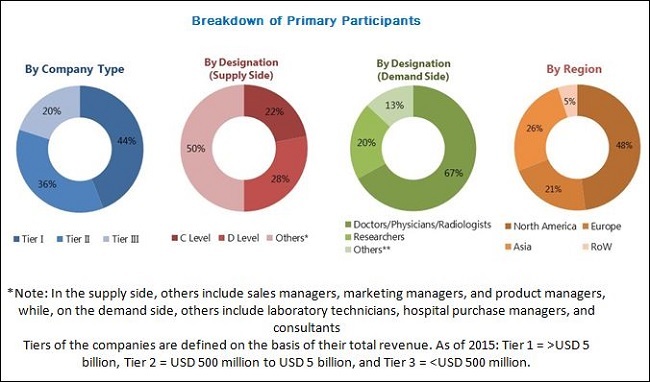 A number of factors such as technological advancements in medical imaging systems & analysis software, growing public- and private-sector investments in the medical imaging market, increasing use of imaging equipment due to rising prevalence of chronic diseases, fusion of imaging technologies, and growing applications of computer-aided diagnosis are driving the demand for medical image analysis software. On the other hand, the budgetary constraints among end users are the factor that may hinder the overall growth of this market. This report segments the market into type, image type, modality, application, end user, and region. On the basis of type, the market is segmented into integrated and standalone software. In 2017, the standalone software segment is expected to account for the largest share of the market. This segment offers high flexibility and easy-to-use tools to inspect, evaluate, and process imaging data. By application, the market is segmented into orthopedics, dental applications, neurology, cardiology, oncology, obstetrics & gynecology, mammography, respiratory applications, and urology & nephrology. The cardiology segment is expected to grow at the highest CAGR during the forecast period. The large share of this segment can primarily be attributed to factors such as increasing innovations in cardiac imaging technologies and the growing number of cardiac imaging tests due to the rising incidence of cardiac disorders. In 2017, North America is expected to dominate the market. Factors such as growing geriatric population, high incidence/prevalence of various diseases, the large number of imaging centers in this region, ongoing research, fast adoption of technologically advanced imaging systems, and increasing awareness about the benefits of early disease diagnosis are some of the key factors driving the growth in this region. 2D imaging has been traditionally used for image visualization and analysis. Based on the observation and analysis of a photographic image/X-ray of the human organ, the radiologist or referred physician can identify medical conditions and decide treatment accordingly. 2D imaging techniques provide sufficient information for simple diagnosis during screening tests or preliminary examinations. The information gathered by 2D imaging can be used as a base to generate 3D images/models. Furthermore, compared with 3D medical images, 2D images have simpler anatomical structures, easier implementation, lower computational complexity, and reduced memory requirements. This technique is significantly used to gather preliminary information on large areas. This technique provides realistic anatomic images easily recognizable and interpretable by physicians/healthcare providers. Currently, almost all surgeries and cancer treatments in developed economies rely on 3D imaging. Multiple scans are combined with the use of software tools to produce 3D images. This provides additional information to radiologists and surgeons, thereby enabling the precise detection and diagnosis of diseases. 4D imaging is emerging as a next-generation solution in the medical imaging industry. 4D images consist of three spatial dimensions as well as the element of time. 4D imaging involves a cinematographic/motion-picture view and provides precise information about moving organs and tissues, such as the lungs and heart. What are the upcoming applications for medical image analysis software? The medical image analysis software market is highly competitive with several big and small players. Prominent players in the market include AGFA Healthcare (Belgium), AQUILAB (France), Carestream Health, Inc. (US), Esaote S.p.A (Italy), GE Healthcare (US), Image Analysis (UK), INFINITT Healthcare Co, Ltd. (South Korea), Merge Healthcare, Inc. (US), MIM Software Inc. (US), Mirada Medical Limited (UK), Philips Healthcare (Netherlands), ScienceSoft USA Corporation (US), Siemens Healthineers (Germany), Toshiba Medical Systems Corporation (Japan), and Xinapse Systems Ltd. (UK). 13.15 INFINITT Healthcare Co, Ltd.